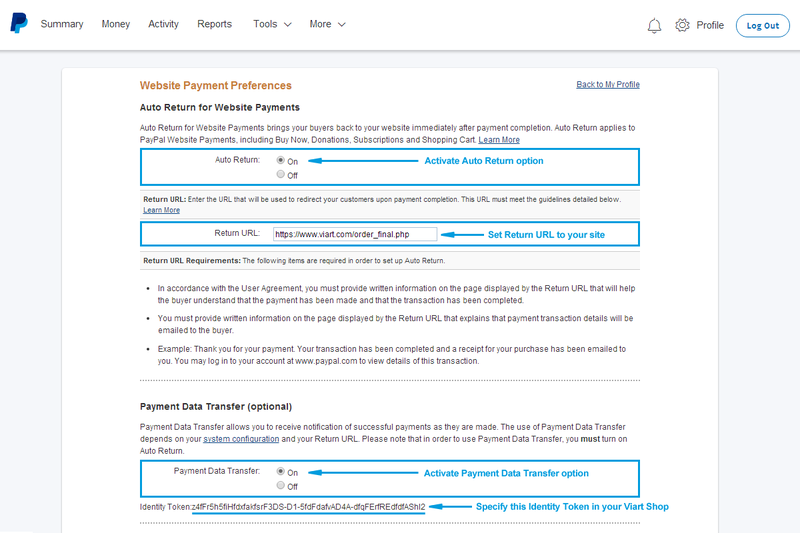 This section describes how to setup PayPal Payments Standard for your ViArt shopping cart. Please, carefully follow all the instructions below. To correctly configure the PayPal Website Payments Standard payment system in your shopping cart you are to make appropriate settings for it. First, you are to create a PayPal Account (if you do not have one). On Profile Settings page on the right navigation you will need to select My Selling Preferences first and then next to Website Preferences please click Update link. To brings your buyers back to your website after payment completion you will need to activate Auto Return option. Please note that www.your-domain.com should be replaced with your real shop domain name. The last option you need to activate is Payment Data Transfer. This option allows you to receive notification of successful payments as they are made and set correct status in your Viart Shop. For this please activate Payment Data Transfer option and specify Identity Token parameter in your Viart Shop. Also, it's recommended to turn on PayPal IPN notifications. For this within your PayPal account please go to 'Profile > Instant Payment Notification Preferences' and turn on this setting and set 'Notification URL' as 'http://www.your_site_url/payments/paypal_ipn.php'. In the parameters list, please specify your business email address where it says 'your.paypal@email.address' and specify value for 'at' (identity token) parameter from your PayPal settings. If you don't want to pass data to PayPal in multicurrencies please specify a preferred currency code like 'USD' for the currency_code parameter. Prompts customer to include a note with payment. Default or 0: customer is prompted to include a note. 1: customer is not prompted to include a note. Prompts customer for shipping address. 1: customer is not asked for a shipping address. 2: customer must provide a shipping address. 1: The address specified in pre-populated variables overrides user’s stored address. The customer is shown the passed-in address but cannot edit it. If the address is not valid (some required fields are missed, including country) or not included, no address will be shown.